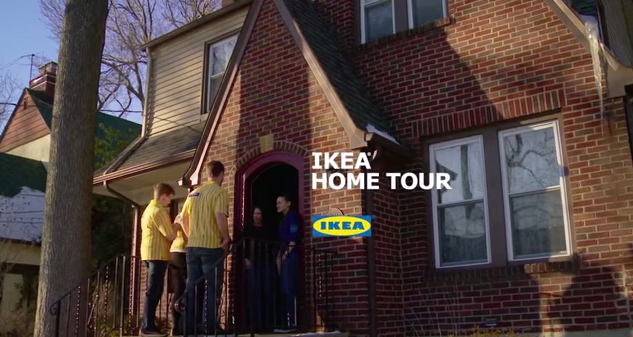 IKEA is making a road trip with a new home tour campaign that’s sure to drive results. Known as a Life Improvement Store, IKEA is taking their marketing show on the road with home improvement style series called “Home Tour” that looks to model itself after popular television programs that showcase radical house design transformations. While on the road, a team of five IKEA designers will not only make chosen living spaces way more efficient, they will also offer advice about the best way to maximize space. To boost their already meaty (or shall I say meatbally) brand recognition, the Home Tour Project Manager said the mission of the program is to show: “that people can do simple things that make a big difference to make life at home better”. In order to be considered for a renovation, applicants submit a video detailing why exactly an Ikea invasion is right for their home. The company is pushing a plethora of social media to show off their before and after efforts. They’ve got pictures on Instagram, updates on Twitter and all the completed “Home Tours” are posted on their YouTube page. Somewhere between a long ad and a short webisode, the Home Tour video series shows an army of Ikea employees descending on an entire room in a house, drills and all, no horsing around. And of course there is the hashtag #IKEAHomeTour. The formula is pretty predictable: a messy, drab and disheveled room is turned into an organized, sleek Swedish space. In the most truly unbelievable moment of an episode, a family’s den is made over and the teenage daughter exclaims: “I can’t wait to do my homework in here!” That would be a design innovation I’m sure many parents would pay through the nose for. The program is set to last for a year and is now making its way down the east coast. The company is pushing a plethora of social media to show off their before and after efforts. good marketing idea i think…. Ikea sure knows how to keep homeowners coming back for more then just meatballs.